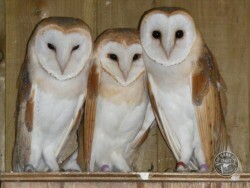 Male Barn Owls are generally paler and females darker, but they can be very variable. 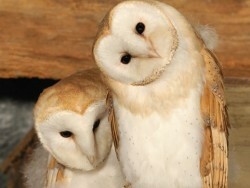 Usually, about 90% of UK Barn Owls can be sexed by their feathers. 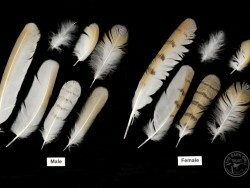 Here are some typical Barn Owl colourations – and some less typical variations between the sexes. 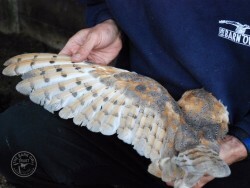 About 90% of UK Barn Owls can be sexed by their feathers. 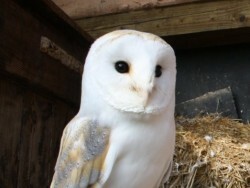 Males are generally paler and females darker. 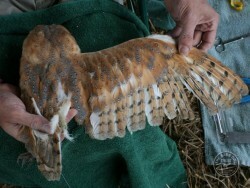 At about 33 days old the underwing covers begin to unfurl. Black spots normally mean it’s a female. 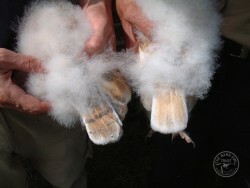 The tails of two nestlings: darker female on the left, extremely pale male on the right. Fledgling on the right is female with its buff coloured throat and black spots on it’s flanks. The one on the left has spots on its flanks so it’s almost certainly female. The middle one has the darkest buff-coloured throat so that’s probably female too. The one on the right could be a male. This is a proven male. Note the very pale colouration especially the tail. Underside of the same male. Note the total lack of little black spots. No spots and very pale – it must be a male. BUT: Some males do have spots on their flanks! 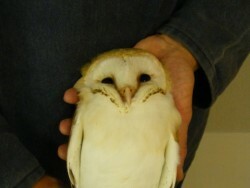 This is a proven male that we radio tracked. 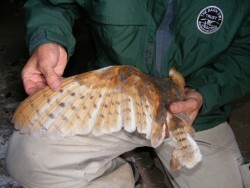 Top side of the same proven male – the dark barring is normally indicative of a female. 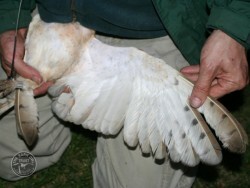 A proven female showing a typical amount of spotting (from chest across to carpal joint). 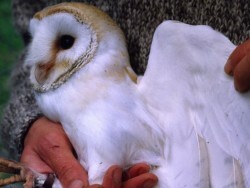 Top side of the same proven female – darker buff and heavier black barring than the male. Another female – although not as dark as the previous photo. A white throat and unspotted chest suggests male. But the spots on the flanks say ‘female’. 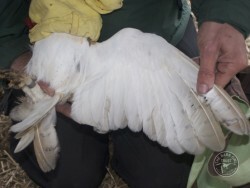 This is one of the c. 10% that cannot be sexed on feather colouration alone. 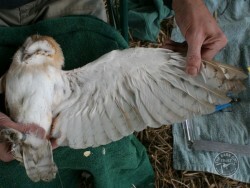 This is a proven male of the European subspecies Tyto alba guttata. 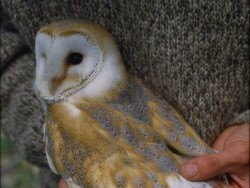 Interbreeding with UK Tyto alba alba birds can result in heavily spotted and/or dark-breasted males that are UK-hatched.